At the annual GreenHomeNYC Green Catwalk, seven speakers presented the latest information on everything from ventilation to greening the moving industry to O&M to-do lists within the sustainability space. Ricky Stephens, co-founder of AgTech X, set the stage by presenting some of the biggest flaws within our country’s current food system. He indicated that 80% of the food grown today is not meant for human consumption, with 40% grown to support animals and 40% to be processed into biofuels. Additionally, though the plant kingdom is diverse, 84% of total US cropland is dedicated to just three crops: corn, soybean, and wheat. The long term prospects for the system are also in jeopardy as farming is not attracting new folks to the industry – the average age of a U.S. farmer is 58. 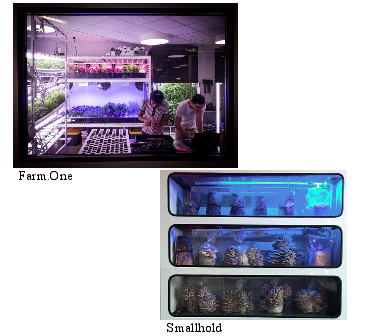 Farm One and Smallhold are two indoor farms housed in restaurants. What can be done to fix our current system? The goal of AgTech X is to create a new food economy, using urban farming as a vehicle to educate, decentralize, and make farming exciting again. AgTech X fosters a collective community by hosting classes, workshops and tours. Its co-lab workspace supports decentralized urban farming methods like Farm One and Smallhold, indoor farms housed in restaurants that produce farm-to-table microgreens. And a recent “Intro to Aquaponics” class by Oko Farms explained the closed-loop system of raising fish, creating fertilizer for plant growth and filtering the water. While urban farming is not a new concept, innovations in the past five years are making it a more intriguing career option for young professionals! Maureen Mahle, Managing Director of Sustainable Housing Services at Steven Winter Associates, posed the thought-provoking question: When it comes to ventilation, are we aiming for the bare minimum by meeting existing ASHRAE standards or are we aiming for a truly healthy environment? Mahle discussed some of the cost/benefits for increased ventilation outside the realm of energy tradeoffs. Research from The CogFX Study, or the Impact of Green Buildings on Cognitive Function sponsored by United Technologies, shows that when ventilation is doubled there is an 8% increase in employee decision-making performance, which brings benefits 150x greater than the resulting energy costs. This optimized productivity, as well as a 90% decrease in indoor VOCs, shows the importance of an increase in ventilation if done intelligently. Effective ventilation occurs when fresh air supply and local exhaust are placed correctly to maximize distribution without affecting noise levels or creating complications in use. Movers, Not Shakers! 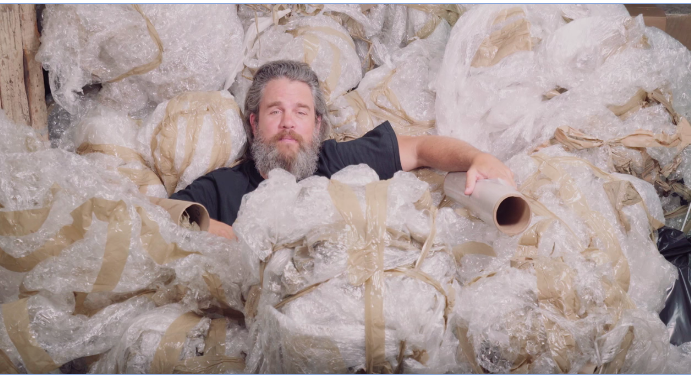 founder Mark Ehrhardt with trashed plastic wrap. Alessandro Ciari, Director of Communications at Movers, Not Shakers!, discussed an industry many may not associate with sustainability but one which is receptive to and in need of going green: the moving industry. Ciari notes that moving creates waste from cardboard, shrink-wrap, and broken pieces of everything along the way. Movers, Not Shakers! offers an environmentally friendly moving service with simple solutions and big impact by utilizing reusable crates that minimize waste from cardboard boxes and tape. Additionally, its fleet of trucks uses biodiesel fuel made from restaurant oil waste that has been processed to make it cleaner. Movers, Not Shakers! also recycles items like textiles and electronics by partnering with organizations like Wearable Collections and the Lower East Side Ecology Center. Michael Brown, Co-Founder & CEO at LogCheck, explained the source of his company’s mantra “Move Slowly & Fix Things.” LogCheck hypothesized that problems such as equipment failure, health and safety incidents, and energy and water waste could be avoided with a user-friendly checklist which would function as a way to stay on top of routine building maintenance. Easy to use LogCheck interface. 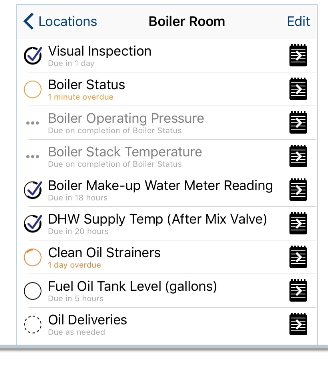 While many facilities still use a paper checklist, and software that fulfills a similar function does exist, much of it is too complex or not made for mobile devices. LogCheck’s success relies on its simplicity and practicality. This simple app interface is easy to use, adaptable to fit any organization, and can also function offline. 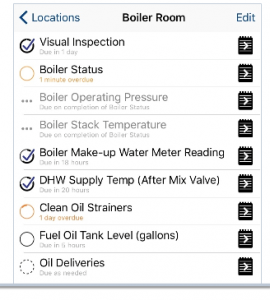 Among LogCheck’s uses are routine building inspection, meter readings and alerts, and sensors and controls. While field operation and maintenance is difficult to enforce, LogCheck helps define expectations between management and staff, keeping everyone on the same page without the need for physical paper work. Linnea Paton, Senior Energy Analyst at JLL, addressed the way New York State is shaping its Value of Distributed Energy Resources (VDER) pricing methodology. Under Governor Cuomo’s “Reforming the Energy Vision” (REV) strategy, New York State is transitioning from Net Energy Metering (NEM) for renewables and other DERs to the Value Stack. The Value Stack assigns prices for the various attributes such as where the system is located, how much it helps the local utility system, and whether or not it provides environmental benefits. This allows VDER to be a more holistic measure than pricing based on kWh. In Phase I of this two-phase transition, projects currently in “advanced stages of development” will receive NEM compensation, but only for their first 20 years. Since long-term VDER rates are not yet published, it currently poses a challenge to developers for pricing systems with long-term paybacks that are still in the concept stage. Paton also shared that NYS won a legal challenge to its Zero Emission Credits scheme, which makes electricity providers in the State pay for a portion of the social cost of carbon associated with non-clean energy. The funding goes to support the State’s nuclear power plants. Other states looking to prop-up their nuclear plants are likely to follow suit. 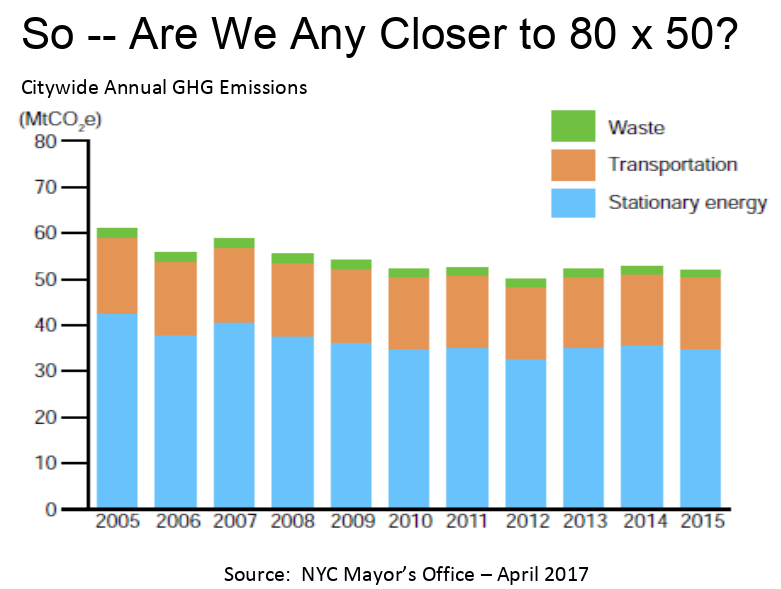 More locally, NYC recently committed to divest city employee pension funds valued at $5 billion from fossil fuel companies. The City also announced that they plan to file lawsuits against fossil fuel companies for damage to New York City from the effects of climate change. With a BArch and Masters in Green Building, Celeste McMickle combined her interests in zero waste, composting, and gardening, and challenged herself to try something new. She founded Celestial Solutions, offering four areas of expertise at the intersection of the built environment and the natural environment: Green Building Services, Waste Reduction and Prevention, Permaculture and Composting, and Project Planning and Support. With accreditation in each of these areas that includes, LEED AP, Green Rater with USGBC, Permaculture Design Certification, and Master Composter, McMickle is building her company from the ground up. After attending school in California, McMickle had the perception that sustainability was not a big area of interest in NYC. Luckily New York has shown itself to be a place where she could start her own company in this field, a prime example that there is much going on here within the sustainability arena. Graph of GHG emissions showing minimal annual change. To conclude the evening, Tom Sahagian, an Independent Energy-Efficiency Consultant, focused on answering the question “Are We Any Closer to 80 x 50?” Continuing from his prior year’s presentation, Sahagian argued that not much had changed from the previous year. 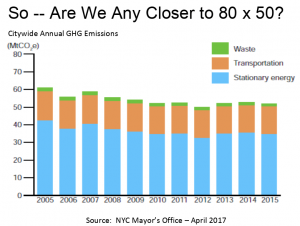 In 2014, NYC committed to reducing green house gases to 80% of 2005 levels by 2050. According to Sahagian, to reach this goal we have to do one or more of the following: reduce energy use in 100% of buildings by 80%, or reduce energy use by 100% in 80% of buildings, or substitute 80% of fossil fuels with renewables. In another calculation, for the city to succeed, it must renovate 780 of its buildings annually for the next 32 years. No matter which way you slice it, this is a huge undertaking and new solutions are a necessity to achieve this goal. Sahagian proposed the following: eliminate steam systems and replace with hydronic heating systems, insulate exterior and/or interior walls, airseal buildings sufficiently, reduce excess ventilation, provide apartment-level heating and cooling control, and install gigawatts of PVs upstate. On a less macroscopic scale, Sahagian stressed the importance of what GreenHomeNYC can do, including support of student-led research projects, participation in public advocacy, and dissemination of information.